TouchNet® Marketplace™ uStores is a secure avenue to accept on-line credit card payments to let students, parents, alumni, and others shop online, register for events, or make donations at the time most convenient for them. Customers will be able to easily navigate to your uStore website. Each uStore is organized using the familiar shopping cart format with customized products and descriptions. 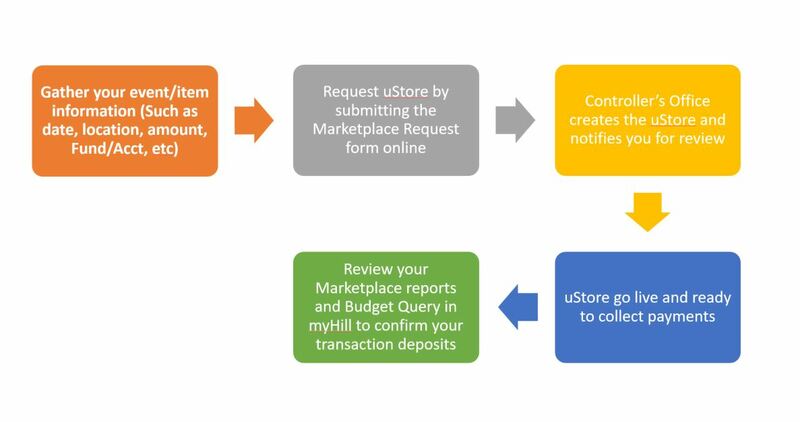 As shoppers make payments, Marketplace automatically updates the G/L accounts in the Banner finance system. Marketplace uStore is PCI (Payment Card Industry) compliant! To set up Marketplace is very EASY. Below are few quick steps for your reference. Please allow 5-7 business days for the request to be completed. Are you ready to submit your request?